An Australian man charged with throwing his four-year-old daughter to her death from a bridge was suffering acute psychiatric distress, a court heard. 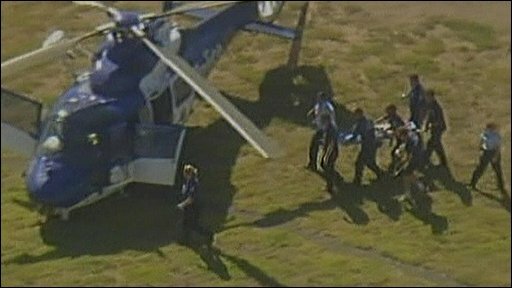 The girl plunged 58m (190ft) from the West Gate bridge in Melbourne into the Yarra river during morning rush hour. She died a few hours later, after being airlifted to the city's Royal Children's Hospital, officials said. The 35-year-old suspect is thought to have been involved in a protracted custody dispute with his wife. The man did not appear at Melbourne Magistrates Court, as he was said to be suicidal and suffering from acute psychiatric distress. The girl was in a critical condition after being pulled from the river. Police spent 45 minutes attempting to resuscitate her on the riverbank before she was transported to hospital. Two other children were in the man's car at the time - the authorities said they were the victim's siblings, aged eight and six. The incident occurred about 0900 on Thursday (2000 GMT Wednesday), when hundreds of other motorists were using the bridge, police said. "No one had the opportunity to intervene... it all happened fairly quickly," Detective Inspector Steve Clark was quoted as saying by AFP news agency. "It's a dreadful set of circumstances, and often you think you've seen it all but you haven't," said Mr Clark. He said the "visibly distressed" man was arrested outside a Melbourne court that deals with family matters shortly after the incident. The Victoria state Premier, John Brumby, described the young girl's death as "a terrible tragedy".